Life Is What Happens: Out foxed again!!! 1. The sun was shinning. 2. There was no line-up at the bank. 3. I found a legal parking spot. 4. A red fox crossed my path!! Well, it wasn't just my path there were, obviously, several other pedestrians, a dozen cars, maybe a few dog walkers and one amazing, very clever red fox. I was coming out of the bank about 2:00pm on a sunny Thursday in January, when I saw this red fox blithely walking along the sidewalk towards me. We do have ravines in Toronto and more wooded areas than most cities, but none were close. Remember this was on Yonge St. - Toronto's main north-south street and in case you didn't know - the longest street in the world. Yonge St, actually becomes highway 11 somewhere beyond the suburbs. Highway 11 goes right up to James Bay, which is a small bay that opens into Frobisher Bay somewhere a little below the Arctic circle. That's a long way away!! But I digress. 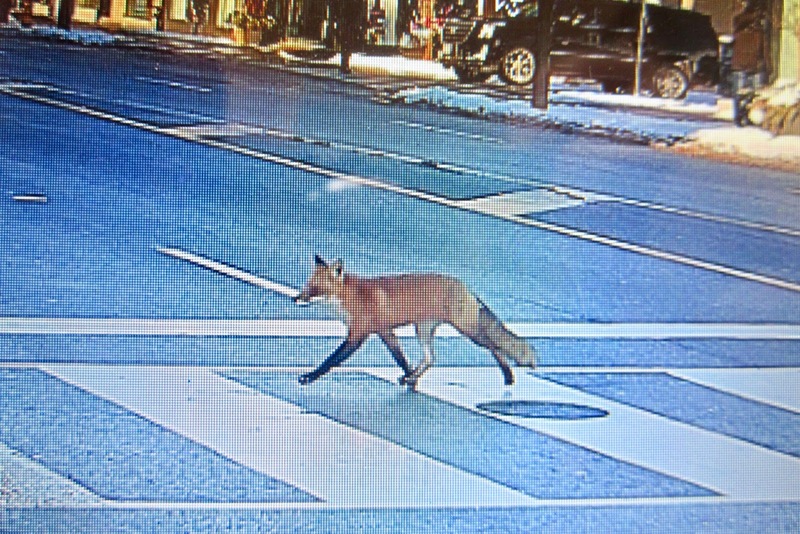 Foxxy was obviously out for a stroll. However, he needed to cross the street to get to where he was going and since he was aware of various cars on the road, he walked to the crosswalk, waited for the lights to change and then crossed. Someone on the other side of the street captured this splendid moment in time. The photo is a little cropped, however, I am on the right side of the street, just a little out of the picture (go figure). The other two pedestrians in the picture walked passed me and commented. At which point, I closed my jaw, which had dropped in awe and answered them!! In fact, I was amazed to see the picture on FaceBook! 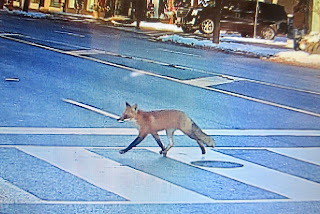 I had been telling everyone about the fox incident and now I had proof!! It would have been perfect, though if the angle of the camera had moved just a degree or two to the right and then I could have said, "Look, there I am." However, this seems to be the story of my life - Never quite in the picture, never famous, always in the wings while others take all the glory!! Charity, thy name is knitting! !